Glory of any school lies in the achievements of its students. 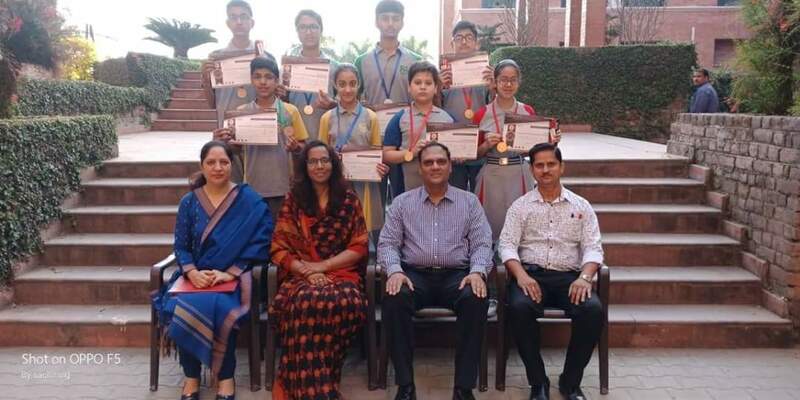 The Heritageans proved their prowess and made the school proud by winning 14 medals in the International Reasoning and Aptitude Olympiad held under the aegis of Silver Zone Foundation, New Delhi. It was an overjoyed moment for the school as its brainboxes brought many laurels and accolades to it. Atharv Dabgotra VI, Ritik Deep VII, Diya Gupta VII, Akshit Gupta IX, Danish Meehmood X, Moulik Razdan XII, . Naindeep Kour VI, Aarush Gupta VIII, Priyam Jamwal IX, Puru Gupta X, Arnav Mahajan XII. Madhav Jandyal IX, Rishab Kumar X, Hermanjeet Singh XII. The winning students were felicitated by the Principal Mr. Akash Pradhan on behalf of the Silver Zone Foundation.